Dollar Energy Fund raised $156,238 during its Cool Down for Warmth event on Jan. 24 and 25, all with the help of local business leaders, sponsors, utility partners and many generous community individuals. The amount raised will provide assistance for approximately 447 Pittsburgh families and individuals who are struggling to afford safe utility service this winter. Though the event is over, donations are still coming in! Those who wish to help local families in need may continue to donate online at www.dollarenergy.org/donate. Over the course of the two-day event, many supporters sat in Dollar Energy Fund’s giant ice house in Market Square to raise funds and awareness for the thousands of families in our region without heat-related utility service. Many individuals and teams exceeded their fundraising goals, including Walter Bridges of Proforma, Morgan O’Brien of Peoples Natural Gas, Dave Spigelmyer of Marcellus Shale Coalition, Dollar Energy Fund’s Board of Directors, Columbia Gas of Pennsylvania, Duquesne Light Company, and FirstEnergy. Duquesne Light’s Subzero Heroes team and Morgan O’Brien from Peoples Natural Gas both surpassed their initial goal of $10,000. Others showed their support by visiting the house and participating in our Bowls for Warmth event. 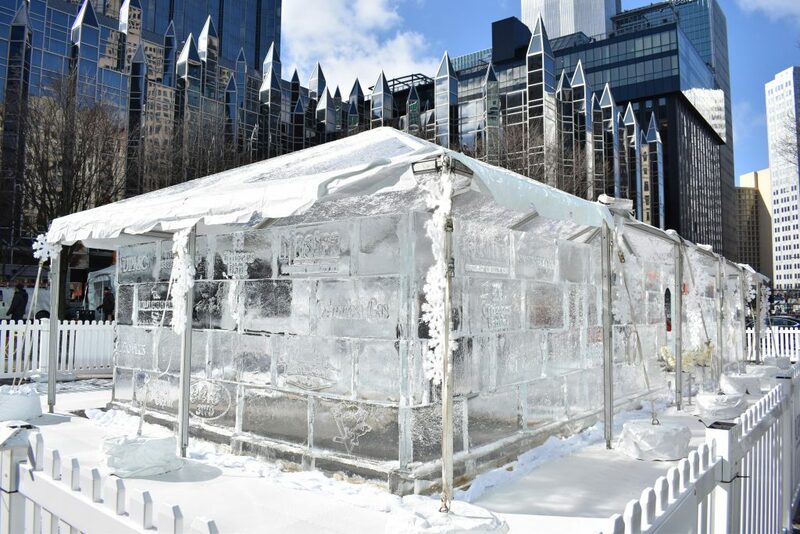 During construction of the ice house and throughout the event, hundreds of downtown Pittsburgh employees passed through Market Square to see the house, take a tour and contribute to the event. Attendees also enjoyed the Dunkin’ Donuts Selfie Wall of Ice, Citizens Bank Ice ATM, Xfinity Ice Television, and the Dormont Appliance Custom Ice Kitchen. Attendees also received numerous giveaways from Dunkin’ Donuts, Chick-fil-A, McCormick & Schmicks, Eat’n Park and Pitt Basketball. Many restaurants donated their time and resources to participate in the Bowls for Warmth Soup Tasting, presented by BNY Mellon, including Bluebird Kitchen, Braddock’s Rebellion, Coughlin’s Law, fl. 2 at Fairmont Pittsburgh, Gateway Cafe, Harris Grill, Lidia’s, Market St. Grocery, McCormick & Schmick’s, Molinaro Ristorante, NOLA on the Square, OTB Bicycle Cafe, Primanti Bros., Revel + Roost, Sienna on the Square, The Smiling Moose, Social House Seven, Ten Penny, Twelve Whiskey Barbeque, and Vallozzi’s. Bowls for Warmth received a great response from the community, causing the event to bring in over $20,000 in donations. In addition, attendees voted for their favorite soup. The winner of the People’s Choice Award was Revel + Roost’s Mushroom and Bacon Bisque and Pennsylvania Beer Cheese Soup. Dollar Energy Fund is grateful for the overwhelming support of our generous utility partners and sponsors, including UPMC, Peoples Natural Gas, Columbia Gas, Duquesne Light, FirstEnergy, Comcast Internet Essentials, BNY Mellon, Dunkin’ Donuts, Citizens Bank, Dormont Appliance, Metropolitan Club on the Square, Range Resources, Deep Well Services, Pitt Athletics, Chick-fil-A, McCormick & Schmick’s, Eat’n Park, Pittsburgh Penguins, Mastro Gourmet Quality Ice, Pittsburgh Post-Gazette, 94.5 3WS, Proforma, Clark’s Studio, and SouthHillsAuto.com. On behalf of the limited-income households we will continue to assist this year, thank you to everyone who supported our event! Follow us on Facebook and Twitter for more updates on future fundraisers, like our Warmathon taking place on February 14 and 15. Click here to view more event photos.